It has been a tense few days as the students have been preparing to take their CSIA Level 1 exam. But our 100% pass rate has been maintained as all the students passed with flying colours! Massive congratulations to all our gappers! CSIA’s newest Level 1 ski instructors! The examiners were hugely impressed with the level of training and preparation of the Ski le Gap students going into the exam. This is unsurprising as they receive coaching from our top level instructors (they all have the highest certification) 5 days a week. No rest for the wicked – the students are back on the mountain (impressive after a lot of celebrations) to work towards their CSIA Level 2. An extended congratulation to those with work visas, as they have all been offered jobs as ski instructors at Mont Tremblant for the rest of this winter. We know you will do Ski le Gap proud! Good luck and congratulations to all our students on passing their CSIA Level 1. 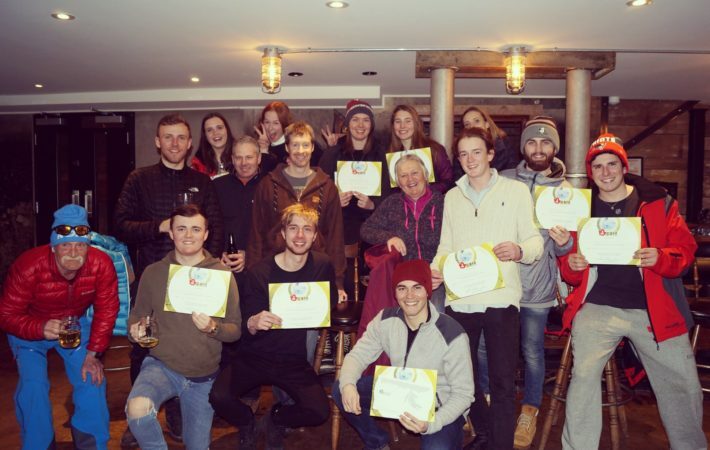 They can now say they are ski instructors…pretty impressive!